Before I start this article I want to thank Paranormal Scholar on youtube for the inspiration on this. If you haven’t visited their you tube I strongly recommend you do. The original 1997 portrait of Delphine Lalaurie image is not available to see but this 2004 portrait by the same artist, Ricardo Pustanio offers a good likeness to what the original would be like. 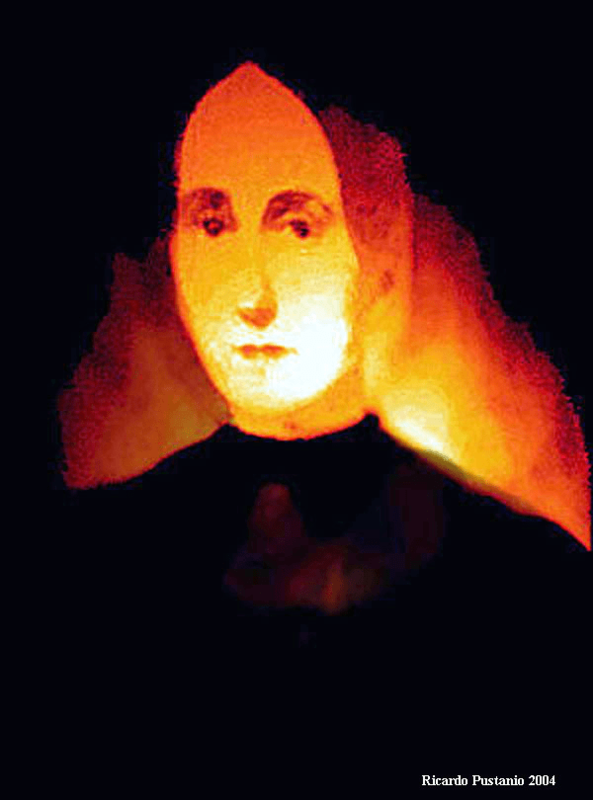 There has been many claims of paranormal activity that surrounds the original, but to understand the nature and background of this portrait, the chilling story of Madame Lalaurine and her horrific actions must be told. Madame Marie Delphine Lalauire is most often referred to as the Most Evil women of all time and The Devil himself hiding behind a pretty face and innocence of a women. The secrets that were locked away in her attic mansion, Was so evil and vile that it has inspired centuries of ghost stories, crime books and even a character on American Horror Story. Delphine was born to an influential white creole family and was raised with the much finer things life had to offer. Delphine married 3 times, first to Spanish diplomat, who died, secondly to a prominent banker who also left Delphine a widower and lastly the only city’s dentist Dr Leonard Louis Nicolas Lalaurie. At this point Delphine was pretty wealthy and had inherited all of her parents wealth as well as her passed husbands. In 1831 Delphine purchased a property in her own name at 114 Rue Royale, New Orleans. She proceeded to decorate the mansion to her dreams and later her husband and daughters moved in. Lalaurie hosted many balls and dinner parties and was quite popular and one of the most well known women in New Orleans. Rumours started to spread however that Lalaurie was mistreating her servants and was later stated that her servants haggered and wrenched appearance didn’t go unnoticed. One neighbour who lived not far, recalled how she had been going up her stairs when she heard a piercing shriek coming from the Lalaurie courtyard. She stood and witnessed a young servant, around 8 years of age, fly across the yard towards the house. Madame Lalaurie pursing her and with a cowhide in hand. The lady watched in horror as she chased the child from one storey to another, until both had reached the roof of the building. The young child, so scared of her punishment she fell from the roof to her death. Later on in the evening, she witnessed the mangled young child be buried in a shallow grave in the corner of the yard. 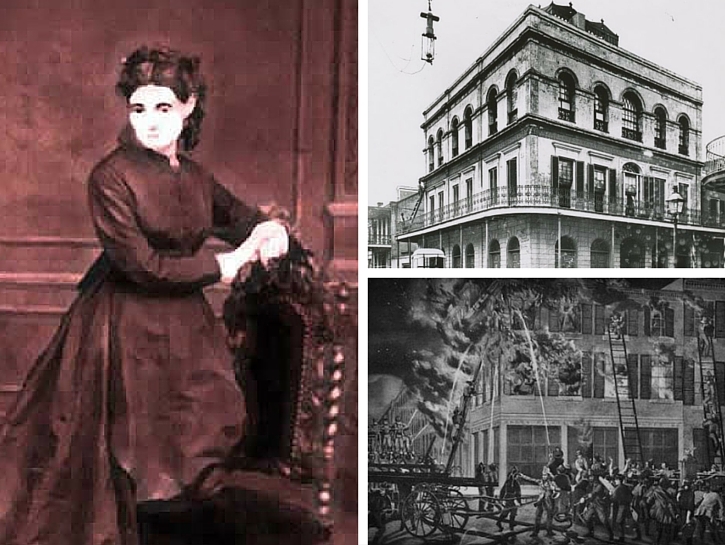 On 10th of April, 1834, a fire broke out in the kitchen of the Lalaurie residence. It wasn’t until after the event that it was revealed that it had been the household cook started the fire, a servant who had been chained within yards of the fireplace. The lady stated it was better to be all burnt together then to allow the mistress to indulge in their torture. The flames spread quickly, attracting the attention of bystanders. Brave locals set out to assist the Lalauries with their assets. Lalauries only interest was gathering her valuables, jewellery and clothing. As time past, people started to realise that Lalauries servants was still in the building. Lalaurine didn’t seem fussed about rescuing them at all, yet the house was heavily staffed by slaves like many households during that time. The keys for the servant quarters was demanded but Lalaurine refused to pass them over. Determined to save as many as they could bystanders knocked down the door only to discover what they later described as ‘ too incredible for human belief’. Seven slaves were found horrifically mutilated. Two corpses was found poking from a hole in the ground. Those who was still alive had been suspended by their necks, their limbs torn and stretched. 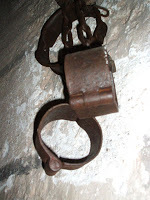 Many constrained in painful positions, forced to wear iron spiked collars to restrict movement. All had been tortured and beaten and the fire had been a saviour for these poor souls. In local legend, bodies of tortured servants were still being found in the mansion over 100 years later, sealed beneath the floorboards where many was kept in the chamber. After the fire the servants were taken to the local jail for their own safety. As for Delphine, she fled New Orleans, chased by an angry crowd and went to France. Where its believed she lived peacefully. The mansion was demolished. The New Orleans Bee wrote ” early the whole of the edifice is demolished, and scarcely anything remains but the walls, which the popular vengeance have ornamented with various writings expressive of their indignation and the justness of their punishment”. In the 1970s, centuries after the dreadful events, the Lalaurie mansion of Royal Street underwent major renovations to transform it into luxury apartments. In 1997, the owners asked Ricardo Pustanio, a local artist, to create a portrait of the buildings previous owner, that being Delphine Lalaurie. When the painting was placed within the walls of the building, along came a string of reports of it having a darkness attached to it. For many years ghost sightings within the old Lalaurine Mansion had been reported. This painting once hung, may have attracted the dark entity. It was believed that Madame Lalaurine herself was the one attached. Reports of activity around the painting was that it moved walls, rock that violently that it tumbled on the floor, residents would report feeling unnerved around the painting, hearing echoing faint voices, feeling cold touches, strong smell of smoke and moved or missing possessions. One female tenant of the apartments claimed that the painting whispered to her directly and sounds of footsteps followed her around her apartment. He felt as though she was being tormented. The painting gave off that much darkness that the painting was eventually returned to the artist. Delphine in life, liked to show off her prized pieces of art. People would have travelled from afar to spend the night within the fine mansion. So could it be that in death, Delphine was attracted to the self portrait so that her art was shown once again? The artist, Ricardo Pustanio states that he never had the intention of labelling the piece as ‘haunted’. Ricardo, has in fact created several more likenesses of Delphine Lalaurine since the original portrait. As far as he is aware, nobody has tried to contact regarding any activity with these ones. The original portrait is now in a private collection. The new owners refuse to discuss where it is located or if any unexplained occurrences have happened while its been with them. The stories of what actually occurred on Royal Street has been warped beyond reality over the years, books published of storied of even more nightmarish scenes that could have occurred and with folklore and haunted tours. But if you strip it right back, brush the lies and look at the hard facts of the story the truth lays there, the events that took place was without a doubt horrific, barbarous and damn right evil without any need for exaggeration. Delphine Lalaurine, dubbed ” A demon in the shape of a women” by The New Orleans Bee, seems like the sort of character that would linger on after death, just to play up to her malevolent ways! Next post: Halsham House Ghost Sightings REVISITED.